Exporter of a wide range of products which include automatic hand dryer. We are engaged in providing our valued customers a wide range of Automatic Hand dryer. This Automatic Hand dryer is available in the market at affordable rates. 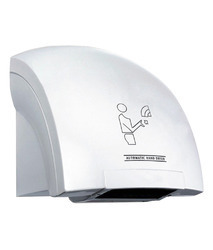 The offered Automatic Hand dryer is extensively used in washrooms of shopping malls, hotels, offices, etc. Our products are of world class quality.